Today's defence related news includes an interview with the Vice Chief of the Defence Staff, the naming of the Royal Navy's newest Type 26 Frigate and severe weather. The wide ranging interview also covered what the Vice Chief referred to as the 'information advantage' and reports that the UK is playing catch up in the information space as countries such as Russia and China develop their own electronic warfare and cyberweapons, but quotes General Messenger saying that we should not “lionise” the Russian armed forces. His comments were also picked up by The Sun, Daily Mail and Daily Telegraph and featured on the BBC Radio 4 Today Programme. Defence Secretary Gavin Williamson chose St. David's Day to announce the name of one of the new Type 26 warships as HMS Cardiff. The third to be named in the City Class of eight brand new, cutting-edge, anti-submarine warfare frigates, HMS Cardiff will provide advanced protection for the likes of the UK’s nuclear deterrent and Queen Elizabeth Class aircraft carriers. The news was reported in MailOnline and circulated by the Press Association. HMS Cardiff will be a terrific tribute to Wales and its capital city. She will bolster the United Kingdom’s defences across the seven seas – protecting our aircraft carriers and defending our waters from intensifying threats. It’s great to see the name HMS Cardiff returning to the Fleet as one of our new Type 26 Frigates, reflecting the Royal Navy’s long-standing bond with the city and the people of Wales. The name HMS Cardiff brings with it a proud history. A century ago the light cruiser HMS Cardiff famously led the German High Seas Fleet into internment at Scapa Flow at the end of the First World War. The last HMS Cardiff, a Type 42 destroyer, also distinguished herself on operations around the world, including the 1982 Falklands campaign, the 1991 Gulf War and service in the Adriatic during the 1999 crisis in Kosovo. This next generation of frigates will encompass the very latest innovations and technological advances to deliver a world class anti-submarine warfare capability within a globally deployable and highly versatile platform. For years to come, as part of a Royal Navy carrier-led task group or working with our international partners, HMS Cardiff and her sister ships will be ready to deliver a wide spectrum of operations from diplomatic and humanitarian missions to high end warfighting, promoting and protecting Britain’s interests worldwide. Broadcasters including BBC, Sky and ITV have all been reporting that the military are supporting emergency services in Lincolnshire by helping to transport health staff to hospitals and support health workers in visiting vulnerable people in the community following heavy snowfall. While the Evening Standard features images of Royal Marines training in the snow and RFA Tidespring battling icy conditions. Our Armed Forces stand ready to help as Britain is hit by severe weather. We’ve already seen the RAF helping doctors and nurses get to some of the most vulnerable people. Our service personnel are showing great dedication and a spirited sense of duty as they support local authorities and keep the British people safe. 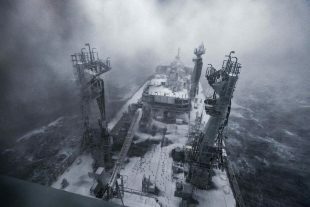 Image taken from the bridge of RFA (Royal Fleet Auxiliary) Tidespring, during bad weather, 15 Nautical miles South of Plymouth.